One month after, where is Hawara? One month after Hawara disappeared into thin air, after tunneling his way out of Burail jail here on January 21, the police has no clue as to his whereabouts. What they have instead are leads which indicate that a terrorist strike engineered by him may be a possibility. The Chandigarh police today questioned Ms Neelam Punia in whose name one of the SIM cards was used in Jagtar Singh Hawara's jailbreak conspiracy. Six police and home guard personnel last night allegedly thrashed a lawyer, son of a senior IAS officer of Haryana, in full public view in the university. The lawyer Rohit Sharma, said the police personnel hit him with a baton in the head, legs, back and left shoulder when he was trying to gain entry into the Jhankar - 2004 cultural festival from the VIP gate. Mr Sharma, son of Financial Commissioner K. C. Sharma, said he had five VIP passes. Mr Sharma, son of Financial Commissioner K. C. Sharma, said he had five VIP passes. He said the police person at the gate tried to stop him from entering from the gate and held him by the collar of his shirt. 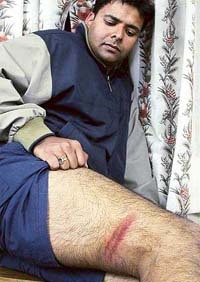 Rohit Sharma shows an injury mark. As the development in and around Chandigarh is mostly unplanned, uncontrolled and unregulated, it is imperative to implement the concept plan — Chandigarh Inter-state Metropolitan Region-2021 (CISMer), available with the Chandigarh Administration. This will require resuscitation of the defunct Co-ordination Committee of which Punjab, Haryana and the Centre are members. A comprehensive plan to make the city adaptable to its changing needs while ensuring that it retains its character envisioned by Le Corbousier was stressed by Mr E.F.N. Ribeiro, former chief planner of the Government of India and Chairman of the architecture branch, All-India Council of Technical Education. When there are instances of parents wanting their child born with-cleft lip and palate deformity to die, the love and dedication with which Dr Ian Jackson raised two-year-old David, abandoned by his family at Peru, South America, is a story of triumph of will power. 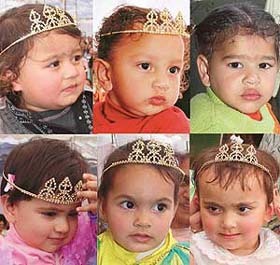 Cherubic faces were the centre of attraction on the second day of the Festival of Gardens at Zakir Rose Garden, today. Competitions like rose quiz contest were also held today, while cultural items and cultural troupes from Assam, Karnataka, Rajasthan and Punjab, enthralled the visitors with their scintillating performances. A colourful programme was presented by tiny tots of Saupin’s School in Sector 32 here during an all-India convention of senior citizens “Milan” at the local Government Museum and Art Gallery. There are 8.2 crore senior citizens in the country. The Commercial Tenants Association, a body of city traders, yesterday announced that its President, Mr Arvind Jain, would contest the coming Lok Sabha poll. At a meeting, the association said the failure of political parties on all issues had forced the traders to fight for their cause. A “Chardi kala bal march”, dedicated to the 300th martyrdom of sahibzadas of Guru Gobind Singh, was flagged off for Chamkaur Sahib from the Punjab School Education Board here today. The Sector 3 police today arrested Asmit Singh (20) in connection with a collision between a car and a scooter yesterday in which a woman and her son were killed near the Kaimbwala turn. The Sector 3 police today claimed to have busted a gang of thieves involved in cases of theft with the arrest of Shaileder, alias Tinu, and recovery of a stolen scooter. A Sector 38 resident, Hemant Arora, lost valuables as thieves decamped with Rs 19,500 in cash and jewellery worth Rs 85,000 from his house while he was away to the hospital attending on his pregnant wife. Marking the end of the three-day youth festival, Jhankar-2004, at Panjab University, the contests in the category of plays, mime and histrionics, put the acting skills of the participating teams to test here today. It was all in the air — the awe, the excitement and the effects created by laser beams at a show organised for the first time in the city on the concluding evening of Jhankar-2004 at Panjab University, here today. In a never-before-seen sight, the laserbeams, green in this case, created waves using light and smoke, sending ripples of excitement among the crowd. 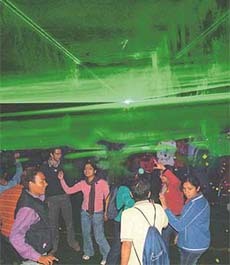 Students dance under the special effects created by the laser show at Panjab University on the concluding evening of Jhankar-2004 in Chandigarh on Saturday. The council for Promotion of Young Talent, a non-profit national educational trust promoted by J.S. Memorial Trust, today honoured 250 students from different schools in the city and surrounding areas for participation in the Homi J. Bhabha Science Wizard Contest organised by the council. Students of Class X of the KBDAV, Sector 7, were given a farewell party by students of the school. The Chairman of the School, Mr B.S. Bahl, and other dignitaries blessed the children for doing well in the examinations. Trials for the selection of cultural items to be presented by various schools at “Guldasta”, a flower show, were held at PUDA Bhawan here today. More than 15 schools of the town took part. In less than a fortnight after Punjab Chief Minister’s aircraft hovered over Prime Minister’s residence, member of Parliament Simranjit Singh Mann has sought directions for shifting his residence from Race Course Road to any other “safer place”. What leaves you non-plussed in Aruna Raje’s “Tum” is a ragged Manisha Koirala giving needless steamy scenes. Long and distasteful, these points at Raje’s desperateness to sell the movie and does not behove a seasoned actress like Manisha. Add to it is Netayana Singh trying hard to be seductive. Students and NSS volunteers of Government Model Senior Secondary School, Sector 19, took part in a rally to make people aware about the National Pulse Polio Drive scheduled for February 22. The rally was flagged off by Mrs Saroj Gupta, Principal of the School. A target population of 1.25 lakh children will be administered polio drops under the second phase of the Pulse Polio Immunisation campaign tomorrow. The UT Health Department has set up 461 booths, including 51 mobile teams, to cover all sectors and villages in the city. The Haryana Governor, Babu Parmanand, has stressed the need for launching innovative health schemes for the rural and the backward areas to strengthen the existing primary health care facilities. 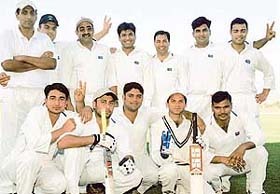 HFCL won the CRY Cadence Cup Cricket Tournament beating SPICE XI by four wickets in the final at the Sector 3 sports complex, Panchkula, here today. Rahul Joshi of HFCL won the best player award, while Vivek Pathania of SPICE XI got the best bowler award and Amit Bhardwaj of HFCL bagged the best batsman award. The tournament began on December 20. The annual sports week celebrations of Shemrock Senior Secondary School, Phase 69, Mohali, concluded today on the school premises. The tiny tots took part in various athletic events. Basketball and handball contests were also organised.